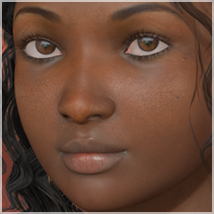 Kewe Black Beauty for V4 | Alizea3D – the virtual tailor ! Kewe Black Beauty is a complete character package for V4.2 . Kewe is a beautiful ethnic beauty with a a unique, sweet face . 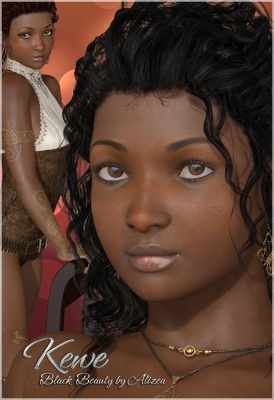 Her dark skin was carefully crafted in order to bring out the most realistic ethnic features such as paler palms and soles , perfectly-imperfect face skin and lips . She can be very versatile , the sensual girl-next-door or the mysterious Gold Goddess , the choice is yours 😉 – so let her warm your runtime ! Her face is a custom sculpt, requiring no morph packages to use . Kewe’s curvaceous bodyshape was created as a mix of Morphs++ and Elite Shapes morphs . 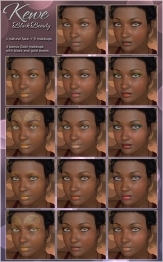 Kewe for V4.2 has 1 natural skin + 10 makeup options , carefully chosen to fit her dark skin tone . She gives you the choice between 11 lip colors and each of those lipstick options has three levels of lip gloss to select from as well : matte , moist and gloss. Makeups and lipsticks are “mix and match” , any lipstick color/shine can be used with any makeup , giving you endless combinations . 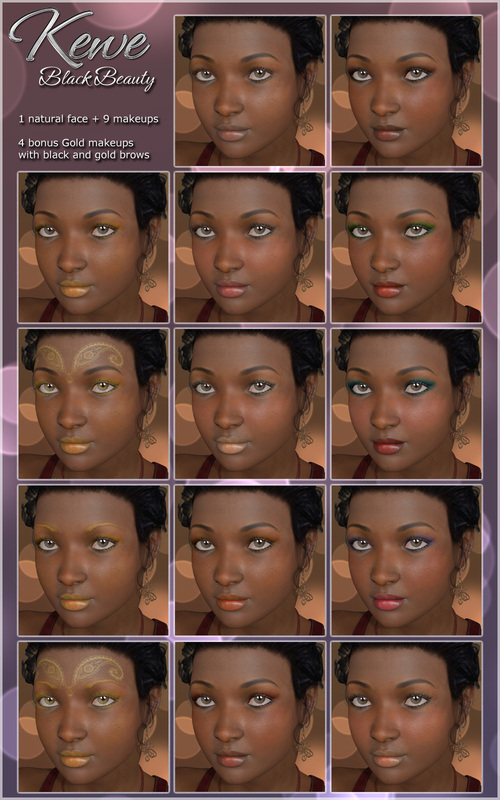 Along with the makeup selections, she has 8 realistic eye colors . Intended for Poser 7 and up, optimized for Poser 9-2012 . For testing purposes only , I’ve included Daz Studio materials for all options as .duf files , optimised using the Elite Human Surface shader included with Daz Studio 4.6 Pro . The latest promo render shows that the product works in Daz Studio 4.6 Pro. However , as I still have a lot to learn about Daz Studio , I only support Poser .